The inviting living room of the main lodge houses a fly shop, an extensive library, and games & puzzles for your restful indoor times. On chilly days, a cozy fire beckons from the wood stove. Enjoy three delicious chef prepared meals in our cheerful dining room. If you just can’t bring yourself to release that perfect salmon or brook trout, our chef will gladly prepare it for your dinner or breakfast. The attractively furnished cabins are quaint, charming and comfortable. Each cabin has a bathroom, hot shower, wood stove, and daily maid service. We run our generator 24 hours a day for your convenience. Ten of our twelve cabins are lakefront. The other two are more secluded but still have lovely lake views. They vary in size, accommodating 2-8 guests in each. 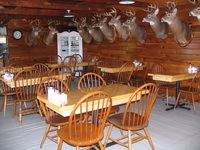 Big Buck Dining Room is open for breakfast, lunch and dinner and licensed to serve beer and wine. Non-lodging guests are more than welcome to join us for dinner with an advance reservation of at least 24 hours. Call (207) 670-0013 to make a reservation. Our Dining room is open! Check here for details.